Twenty years after the release of their groundbreaking debut album Songs of Secret Devotion, vocalist/flautist Sharine Borslien and guitarist/producer Ron Hagadone will carry the torch of their dearest music project in its new California Central Coast iteration with bassist Daniel Paul Kieselhorst and percussionist Bill Watson. After an unsuccessful attempt to re-form in 2012 with a percussionist and a cellist who both dropped out in rather dramatic ways, Sharine and Ron had all but given up on the idea of the Hot 'n' Swirl Ensemble. But now, Watson and Kieselhorst together bring a fresh outlook and inspiration to the group, energizing the phoenix-like project. Characteristically defying and embracing the traditional pop song format, original songs by the Hot 'n' Swirl Ensemble feature a blend of Celtic, Gypsy-jazz, and folk-rock music with eclectic Classical arrangements that explore evocative and suspenseful moments, taking listeners on a dramatic and liberating journey. Original songs like "Goin' Down Slow," for example, feature tempo changes, guitar parts that range from delicate to bombastic, well-placed percussion "ear candy," pizzicato bass accents, vocals with variegated texture and style, and flute parts that flutter and swoop. The 20th anniversary re-recording of the ensemble's debut album, Songs of Secret Devotion, is scheduled for early digital release on January 15, 2016 through CDBaby and other outlets, followed by physical release on January 23 at Sandoval's Cabaret Room in Atascadero, California. Recorded at BlipsWerx Productions "Studio A" in the final quarter of 2015, the four members worked to achieve sonic and poetic epic-ness in the music under Ron's direction. Meanwhile, Sharine managed her skills between recording, designing the ensemble's website, and creating the CD packaging design. 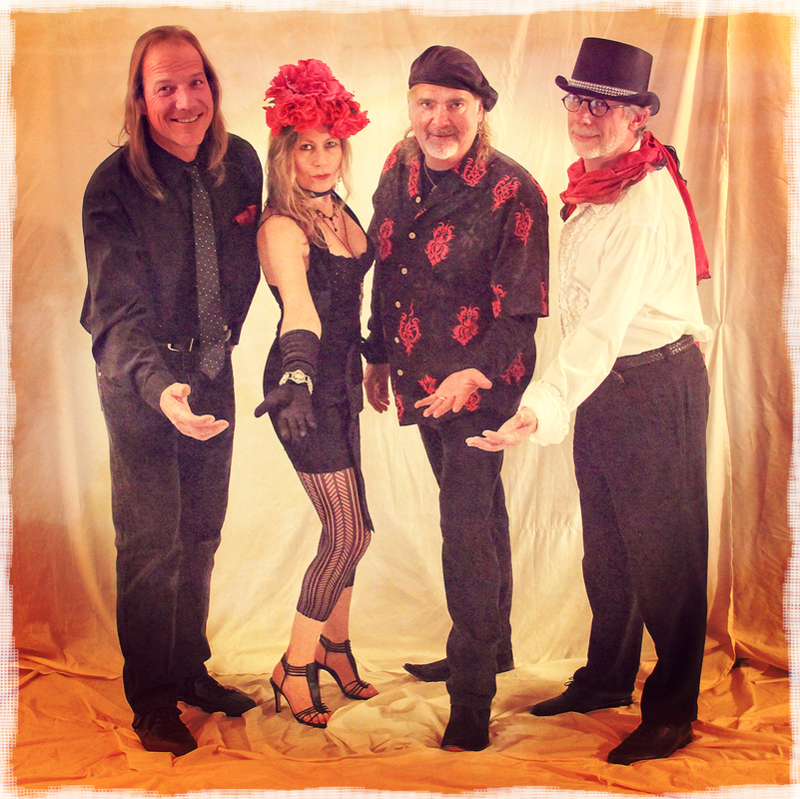 Look for Sharine and the Hot 'n' Swirl Ensemble at private parties, concerts, and special events at wineries, where they perform original and cover songs for a pleasantly memorable musical experience. Buy the ​Songs of Secret Devotion CD or digital download through their CDBaby widget! In 1993, Ron and Sharine joined forces in songwriting, recording, and performing throughout Los Angeles, California. Searching for their signature sound, they crafted the "Songs of Secret Devotion" brand and recruited cellist Michael Duron from the UCLA symphony to complete Sharine and the Hot 'n' Swirl Ensemble. The group performed in clubs and concert halls from the Amazon Bar & Grill to Fais Do Do, from Genghis Cohn to the Alligator Lounge, with bragging rights of being the first contemporary band on the scene to include cello as a feature instrument. In between rehearsals and gigs, Ron arranged material for their debut recording to be titled Songs of Secret Devotion. Tracking began in September 1995 in the Santa Monica bedroom ADAT studio of Guy Marshall (songwriter for Pat Benatar, BayWatch, et al). Sessions were held monthly, with pre-production done off-the-clock by Ron and Sharine, and the recording of all eleven songs was completed in 1996. Guy referred the project to Pat Sullivan, then on the team at A&M Records, who mastered the CD and prepared it for professional duplication. During downtime between recording and productions sessions, the ensemble continued to perform on a lighter schedule while Sharine started working on graphic design for the CD art. With a vast array of photographs by Darek Banasek and the design assistance of Robin Rabideh at Access Print & Copy, she created the jewel case insert artwork based on a concept from Steve Nixon. The cover photograph came from a lab error made when Darek accidentally poured the wrong chemical into the bath, creating a satin drape look on the image. He had tried to hide it from Sharine, but she insisted on seeing it, instantly recognizing the brilliance in his "shameful mistake." Sharine, along with Jennifer Shergold, promoted the CD to over 100 radio stations in the U.S., sparking a coast-to-coast tour. While Ron and Michael stayed home to meet other obligations, Sharine and songwriting partner Al Villanueva toured during autumn 1996, from California to New York City and back. Meanwhile, Michael went on to graduate school, Ron graduated to the blues, and Sharine retreated into songwriting mode. Sharine the Hot 'n' Swirl Ensemble washed away with the rains of El Niño, only to be resurrected nearly twenty years later and 200 miles north of LA in California's central coast. Coming soon: we will post images of archived materials such as early newsletters, concert flyers, photos, and more! ​for Sharine and the Hot 'n' Swirl Ensemble!